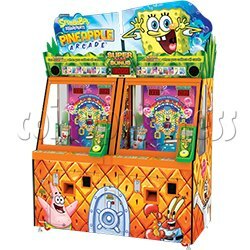 SpongeBob Pineapple Arcade Redemption Game Machine is an arcade machine made by Andamiro and distributed by Bandai Namco Entertainment. In this beautifully styled cabinet, this tokens and arcades pusher features collectible cards around the playfield with the player having to try to knock the cards off the tray. Players must skilfully time the release of a token through moving targets to drop tokens, win free plays, bonus tokens and score cards that fall over the edge. There are 9 collectible cards that feature the world famous characters. The players can trade the cards for tickets or hold them until they collect all 9 cards for the ultimate super bonus! Players insert coins, seize the opportune moment prss the right side button, the coin drop down from the slideway, and the coin through the hole of turntable, and the lights on the turntable began to twinkle, where the light ends up, player can receive corresponding rewards, push the coins and the circle off the platform, player rewared the circle or corresponding tickets.